This category includes companies that provide full-stack solar implementation: site inspection, solar panel design (startups may work with partners or have their own engineering teams), installation in the home or office, and provision of maintenance support. The user may sign a lease or a power purchase agreement with the company, mostly at no upfront costs and a monthly fee. The arrangement is aimed at reducing the cost of the electricity bill by using renewable energy on site. There were 127 deals to this category since 2012, with 55 deals going to residential solar. Residential: The most well-funded private company in the residential solar market is Texas-based Sunnova Energy ($805M). More recently, PosiGen in Louisiana, and SolarMax Technologies in California, raised $20M each for residential solar installations. PosiGen reportedly has a leasing agreement that targets low and mid-income families. Commercial: This sub-category includes companies focused on solar projects for commercial buildings. India-based Amplus Energy is the most well-funded commercial solar company on our list. It received $150M in equity funding in 2015 from energy-focused global investment management firm I Squared Capital. Their projects include rooftop solar for Walmart India, Domino’s, and Hilton Hotel, among other enterprises. Utility-Scale: We classified utility-scale as large-scale solar farms that produce at least 10MW of energy. The top deal was a $250M private equity round raised by Japan-based Nippon Renewable Energy. The company recently partnered with Schneider Electric for a 36MW solar power plant in Mito City, Japan. 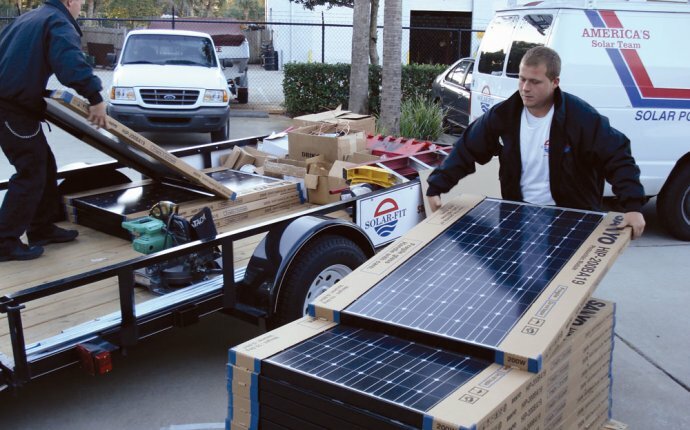 This category includes companies working on the basic building blocks of a solar power system, including new solar cell technologies, inverters, and generators. This category has seen the most deals, 147, since 2012. 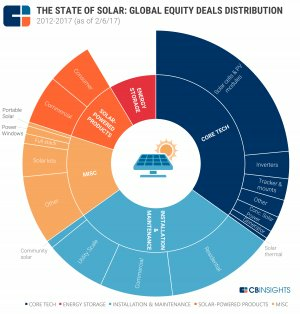 Solar cells and PVs: Nearly 100 deals went to startups working on solar cells and PVs, making it the largest sub-category for deals on the list.This includes companies working on efficient photovoltaic (PV) technology, advanced solar cells, as well as B2B companies manufacturing silicon for the PV industry. Startups here have raised nearly 100 deals since 2012. In 2016, the top round went to Germany-based Heliatek, which raised a $47M Series D from investors including High-Tech Gruenderfonds and BASF Venture Capital. Heliatek is working on “less than 1 mm thin solar films.” Goldman Sachs invested $25M in Minnesota-based tenKsolar, which sells photovoltaic modules. California-based Silicor Materials has raised over $300M in equity funding and is the most well-funded startup. The company produces “solar silicon” for the PV industry and is backed by Hudson Clean Energy Partners. Other: Around 15 deals went to startups developing inverters. Imeon Energy raised $1.8M in Q2’16 from France-based VCs Ouest Croissance and Pleiade Venture for developing a smart grid inverter. Startups developing trackers and mounts raised over 10 deals. Trackers are used to orient the PV module in the direction of sunlight. QBotix, a robotic tracker which was backed by Draper Nexus Ventures, Firelake Capital, New Enterprise Associates and Siemens Venture Capital, was declared dead in 2015, while its competitorwas acquired by Flextronics International for $330M the same year. The remaining deals in this sub-category, around 25, went to startups developing generators, solar heaters, power optimizers, and concentrated solar power (CSP) technology, among other things. Nearly 50 deals went to companies in this category. Consumer: This includes startups working on products ranging from solar-powered backpacks to solar lamps. In Q4’16 General Catalyst Partners seed funded Sunflower Labs, which is developing a solar-powered smart security system for homes using sensors and drones. Solar lighting company d.light raised a $15M Series D in Q3’16 and an additional $5M equity round in Q1’17. Finland-based Tespack develops solar-powered backpacks and raised $230K in seed fundig in Q2’16. Commercial: Applications here range from smart windows in offices to farming and irrigation equipment. The category includes deals to startups like Oizom (solar-powered air quality monitor), RavenWindow (glass windows that turn tinted depending on outside solar heat), and Wakati (food storage solutions). This category includes companies focusing on energy storage solutions that integrate with solar panels. Over 35 deals went to startups here. Startups here raised 12 deals just in 2016. Sonnen raised an $85M Series D round in Q4’16 from investors including INVEN Capital, GE Ventures, and Envision Energy. Sunverge Energy raised a $36.5M Series C from investors like Siemens Venture Capital and Softbank China Venture Capital. Aquion Energy, which is developing salt water batteries, raised $33M in a Series F round. You can read more about grid energy storage startups here. Solar Kits: Over 15 deals went to startups working with mid- and low-income families in rural areas. Families and small businesses are given a “solar kit” which may include solar-powered products like lamps and charges, as well as small PV modules. Lumos Global in Nigeria raised a $40M round in Q4’16. Tanzania-based Off-Grid Electric raised $25M in Series C in Q4’15 and an additional $10M in Series D in Q3’16. London-based BBOXX raised $20M in Series C in Q3’16. Solar Windows: Startups like SolarGaps in Ukraine and in the US are working on windows and smart blinds that track and convert solar energy to electricity. Full-stack: Startups here work on a range of custom solar solutions, from panel design to solar-powered products. All 5 deals in this category went to startups working in India, like kWatt Solutions and Zynergy. Portable Solar: Two seed/angel deals went to Masar in the Netherlands and Renovagen in the United Kingdom for mobile/portable solar power generations systems.